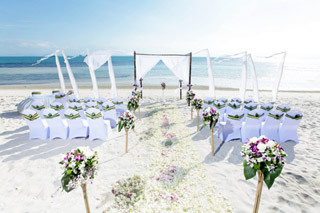 Picture yourselves exchanging vows on a white sandy beach under a clear blue sky or backed by a spectacular sunset. Imagine hearing the gentle sound of the sea and feeling the soft ocean breeze on your skin. Koh Samui is a place where dreams of a tropical island wedding come true, especially with a range of private villas to choose from as the perfect venue. Couples who opt to get married on Koh Samui can personalise their wedding day celebrations to their hearts’ desire – from the type of ceremony right down to the food and entertainment. In fact, many couples go for an all-out Thai-style service, including the beautiful ritual of a traditional Buddhist ceremony. This is a great way to get wedding guests involved in the rituals and local culture, as everyone ties a string round the wrist of the bride and groom to wish them good luck in their union. Guests, bride and groom also make an offering to the saffron or orange-robed monks that chant their blessing as part of the service. It is also possible for couples to opt for another type of religious ceremony, while non-religious exchanges are perhaps the most popular, with trained celebrants available to lead the vows and ceremony in a range of languages to suit the specific needs of the bride and groom. 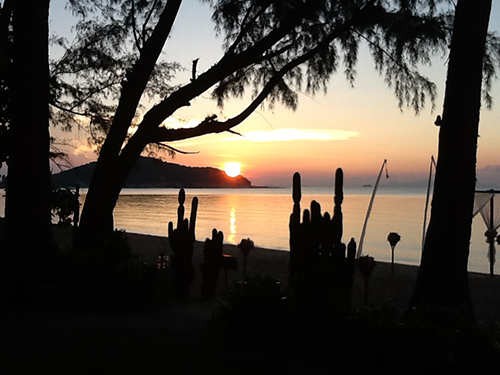 Koh Samui is home to a growing number of world class resorts that offer couples a variety of wedding packages. However, an increasing number of couples are choosing to get married in one of the Kingdom’s luxurious private villas for the opportunity to truly personalise their big day. Opting to get married in a private villa means bride, groom and guests have the whole place to themselves, which makes for a much more exclusive wedding as there is no chance of other guests from the hotel wandering or gate-crashing the party. Wedding planning agencies like The Signature Weddings can even help choose a menu, which is not restricted to the limited choices sometimes offered by hotel packages. At one of Koh Samui’s private villas, guests can indulge in the spicy cuisine of a traditional Thai buffet, a formal Western sit-down meal or a sumptuous seafood barbecue around the villa’s private pool. The bride and groom also have a greater range of choices when it comes to entertainment options. 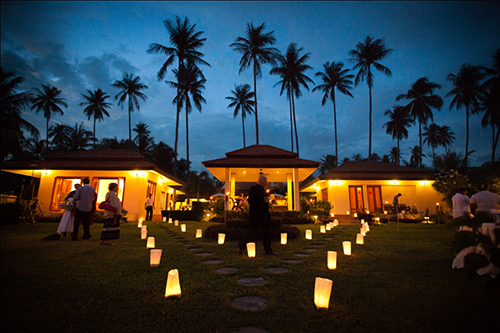 Jazz bands, DJs, acoustic guitarists or even a troupe of traditional Thai drummers can all be organised to entertain guests at a private villa, forging memories lat will last a lifetime. Perhaps the best part of organising a destination wedding at a villa on Koh Samui, is the fact that couples really don’t have to handle much of the organisation or logistics themselves . Dedicated wedding planners work hand-in-hand with couples from the very beginning of the process while the couple is still back in their home country. They make sure the couple’s every need is met before, during and after the celebration. Wedding planners are also able to assist in the legal procedures required for an overseas union, arranging for the necessary paperwork beforehand and also once the couple arrive in Thailand.